Jordan Taylor (left mid) – AISK, Chris Paul, (right back)- Lucaya International School (Freeport – Bahamas) in a heated battle for the ball in a group stage match on Day 1 of SoccerFeva 2019. 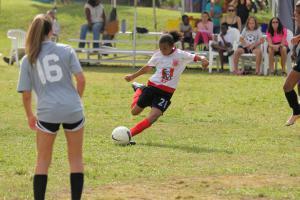 In their 25th Anniversary year, AISK proudly hosted over 80 international students from schools around the Caribbean at the annual SoccerFeva International Football Tournament. The competition saw schools from across the region compete not just against the AISK Hurricanes, but a myriad of other local Jamaican schools for the region’s largest U19 student-athlete match up. This year's 2 day tournament began last Friday, February 8 and culminated with the finals on Saturday, February 9 2019. International participants from; Cayman Prep and High School, Lyford Cay International School (Bahamas), Lucaya International School (Bahamas) and Cedar International School (British Virgin Islands) were matched up against local student athletes from AISK, Hillel Academy, Campion College and Immaculate Conception High School. The student athletes and coaches played their hearts out during the 2 day long tournament and showing superb sportsmanship and skill. 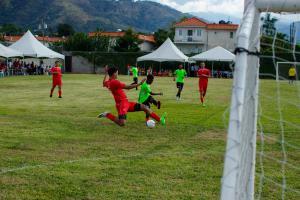 This year AISK SoccerFeva saw last year’s champions Hillel Academy defending their title against Campion College. Which was a heated match with Hillel (Boys Team) walking away with the AISK SoccerFeva Cup Championship with a goal scored in the last 30 seconds of the match taking them to 2 vs 1 and cementing their claim to the Cup. 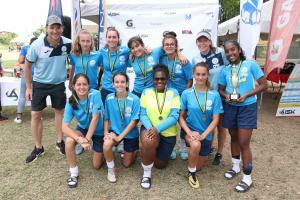 Cayman Preparatory & High School (Girls Team) snagged the Cup from Lyford Cay with an easy 2 vs 0 victory maintaining their Title for the 2nd year. This year’s Cup Runner Up Teams Lyford Cay (Girls Team) Campion College (Boys Team) also played incredible matches over the 2 day tournament. This year Shield Competition had a new twist which was the introduction of the Caribbean Select Team. An idea was conceptualised during a coaches meeting in the Bahamas at The Lyford Cay U14 tournament in November 2018. AISK Athletic Director, Allan Roper wanted to find a way to make the tournament more accessible for the regional teams. It proved to be a success with the secondary Tournament Winners seeing the newly created Caribbean Select Team (Boys Team); comprised of athletes from smaller international schools as well local athletes; walk away with the Shield and local stars Immaculate Conception High (Girls Team) claiming stake to the Shield for the girls with a free kick made by striker Danae Walters in the last shot of the game. The AISK SoccerFeva 2019 Tournament saw massive support from the business community and companies such as Gatorade, Iron Rock Insurance, Locker Room Sports, NOA, Main Event and Neutrogena all stepped up to support local sports and athletes at this year’s SoccerFeva.